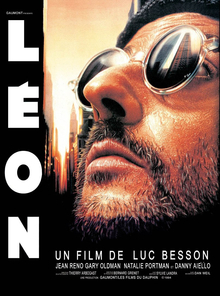 Léon (Jean Reno) is a professional killer who works for New York’s mafia. When a corrupt DEA agent named Stansfield (Gary Oldman) murders almost the entire family in the apartment next door, Léon finds himself the unwilling guardian of the sole surviving daughter Mathilda (Natalie Portman). Given his somewhat flabby, effects-oriented films of recent years – notably Valerian and the City of a Thousand Planets and Lucy – it is actually a refreshing surprise to jump back 24 years and see just what a talented and effective filmmaker Luc Besson used to be. Léon: The Professional is my favourite of Besson’s films (its original French title was simply Léon, while it’s international title was The Professional. It seems to go by a portmanteau of both now). It is an action film that boasts effective and thrilling sequences, and it is chained together with a story that is simultaneously familiar and refreshingly original. The film charts a very close course to quite challenging material. The violent massacre that delivers Mathilda into Léon’s care includes the machine-gunning of a four year-old boy (Mathilda’s brother). Rather than see Léon as a guardian and father figure, Mathilda takes him as an object of immature infatuation. That’s the sort of thing that could be nipped in the bud, but Léon is demonstrably not a normal mature adult. He is catastrophically emotionally under-developed, with a murky and violent past that Besson only hints at throughout the film. Without the capacity to understand and challenge Mathilda’s motivations, Léon finds himself well in over his head. Handled poorly, and the film would be repellent. Instead it feels uncomfortably real, and considerable more layered and complex than any run-of-the-mill action film. Jean Reno plays Léon wonderfully. When he’s working as a hitman he is on safe territory, and so Reno plays him with an eerily effective calm. The moment he finds himself out of his depth, he becomes an awkward and jittery mess. Despite being a professional murderer, Léon comes across as sympathetic and vulnerable – and much of that is down to Reno’s exceptional performance. If Reno has it tough, one can only imagine the task that faced Natalie Portman in her first feature role. She was 12 when she played Mathilda – a girl exactly the same age – and was required to show off strength, rage, sorrow, vulnerability, sexuality, and confusion. It is a genuine performance – something you do not always get with juvenile actors – and immediately marked her out as a formidable talent. As the villainous Stansfield, Gary Oldman is effectively given license to over-act terribly, but it’s an over-acted performance that works. He is a wild and funny contrast to the lower-register coolness of Léon. The film’s action is relatively brief and sparsely distributed across the film, but the climactic siege – in which Stansfield brings an entire SWAT team to bear on Léon’s apartment – is one of the finest ever put to film. It stays just on the right side of believable, while still finding plenty of opportunities for violent and explosive excess. The amount of action in the film seems just right, as does the smooth and attractive photography, and Eric Serra’s minimalist score. It all pushes the audience focus back onto the characters; it is that character focus that makes Léon: The Professional transcend its genre so effectively. Agreed. Which cut do you prefer? The extended cut expands on Mathilda’s infatuation really well, but in light of Besson’s own relationship at the time it’s possibly less dubious to stick with the theatrical edit. Agreed – Such an amazing film. It’s a revelation every time I rewatch it.